Consult your Accountant for retirement financial advice on pension, saving and investing. If you are retired or nearing retirement, the accountant is the man, or woman, who, in conjunction with the trustees, investment manager, and actuary is minding your Pension Fund. 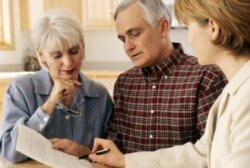 Retirement planning is about more than the important topic of Retirement Financial Advice. You have other needs to consider after you have done the financial planning. Whilst acknowledging this, I will point out that there is a section on Retirement Financial Planning on this website, which I hope you will read. Also, I was a Finance Director, with responsibility for liaising with the external company pension manager, the trustees, and the investment manager. And I believe I managed my own pension arrangements in a satisfactory manner. But who is this Accountant you are advised to consult? There are different types of accountants, just as there are different categories of doctors and engineers. An Auditor may be an expert on Sarbanes-Oxley, but I don’t think you want to talk about that! Or a Management Accountant may have written a thesis on Relevant Costs, but don’t ask him if it’s a good time to buy an annuity. And accountants are not economists so don’t expect him/her to be an expert on interest rates and the business cycle. Is your accountant happy in his/her career? As a former Finance Director, I would be dismayed to think that my ‘dullness’ was one of the factors that contributed to my success in that phase of my career! Let's start with the perspective of Counselor John Cleese and the Monty Python Team from ‘And Now for Something Completely Different’ screenplay, 1971. Here we see John Cleese coaching the hapless Mr Anchovy. Counselor: Well, I now have the results here of the interviews and the aptitude tests that you took last week, and from them we've built up a pretty clear picture of the sort of person that you are. And I think I can say, without fear of contradiction, that the ideal job for you is Chartered Accountancy. Counselor: Jolly good. Well back to the office with you then. Counselor: Well, Chartered Accountancy is rather exciting isn't it? Anchovy: No it's not. It's dull. Dull! Dull! My God it's dull. It's so desperately dull and tedious and stuffy and boring and desperately dull. Counselor: Well, er, yes Mr. Anchovy, but you see your report here says that you are an extremely dull person. You see, our experts describe you as an appallingly dull fellow, unimaginative, timid, lacking in initiative, spineless, easily dominated, no sense of humor, tedious company and irrepressibly drab and awful. And whereas in most professions these would be considerable drawbacks, in Chartered Accountancy they are a positive boon. Mony Python's caricature of the Chartered Accountant is a classic comedy sketch, which suggests that John Cleese knows even less about Accountancy and Psychometric Testing than he does about Hotel Management! If you are retired or nearing retirement, the accountant is the man, or woman, who, in conjunction with the trustees, investment manager, and actuary is minding your Pension Fund. No doubt the stereotype still exists, boring conservative bean counters, so we can still laugh at the John Cleese sketch. But with the power the economic downturn has given the accountant, Mr Anchovy may have the last laugh and be happy to be a Chartered Accountant. It is important for you to take control of your retirement planning and make decisions regarding your pension. Are you planning home improvements? Have you discussed your retirement financial planning with a retirement coach?